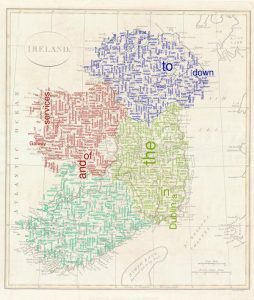 A map of the most frequent words in news articles mentioning autism, by Irish province – different place, different autism? Much of the content is based on ideas and images that I have previously posted here, so you will have a good idea of what to expect if you look through my blog history.The central element of the exhibition is analysis of text written about autistic people, contrasted with text written by autistic people. Sources of text for the visualizations include medical textbooks, the Diagnostic and Statistical Manual of Mental Disorders (the DSM, one of the primary definitions of the diagnosis ‘autism spectrum disorder’), and fiction with characters presented as autistic. These are contrasted with autobiographical accounts by autistic people. Autism is defined through language, with a definition that changes over time and differs between different places and different groups. The autism in the DSM (http://wordpress.stuartneilson.com/autism-and-identity-in-the-dsm) is very different from the autism in newspapers (http://wordpress.stuartneilson.com/how-newspapers-write-about-autism), and both are different from how autistic people describe their own lives. I use photographs and other imagery to explain and expand on some of my ideas (http://wordpress.stuartneilson.com/the-sensory-impact-of-story-telling). I will post more including names, dates and times of presentations when everything is confirmed, and remind closer to February.